The Charybdis was launched from Earth on July 23, 2037, under the command of Colonel Stephen G. Richey. The ship was Earth's third manned attempt to travel beyond the Sol system. During the mission, NASA lost telemetry from the shuttle when it was moved from the Sol system to the distant Theta 116 solar system. In the process, the ship was destroyed and the entire crew except for Colonel Richey were killed. Richey awoke to find himself in an advanced simulation of the Todd Matthews novel Hotel Royale built on the surface of Theta VIII. He continued to live there for the rest of his life. In 2365, the debris of the Charybdis was discovered in the upper atmosphere of Theta VIII by a Klingon cruiser passing by near the system. The remains of the ship were investigated by the USS Enterprise-D. A piece of the debris was beamed aboard for analysis. It contained the American flag and NASA logo. Based on the analysis, the shuttle had been destroyed by molecular disintegration of the hull, similar to weapons fire. In the real world, the NASA "worm" logo that appeared on the ship debris was retired in 1992, three years after the episode first aired. The original mission patch for Charybdis used in the broadcast version of "The Royale" was a reuse of the mission patch for the Apollo 17 lunar mission, the last to take men to the moon. The names listed on the patch ("Cernan", "Evans", and "Schmitt") are for Commander Eugene Cernan, Lunar Module Pilot Harrison Schmitt, and Command Module Pilot Ronald Evans; fictional mission commander Steven Richey was not listed. When "The Royale" was remastered for the TNG Season 2 Blu-ray release, the mission patch was revised to eliminate the Apollo 17 crew names from the design - the patch now shows the words "NASA" and the mission motto "First beyond the Solar System" in place of the crew names. From the Star Trek Encyclopedia (4th ed., vol. 1, p. 135), "In Greek mythology, Charybids was a sea monster who was once a human woman, the daughter of Poseidon, but was banished to the ocean, where she sometimes manifested as a deadly whirlpool…In the remastered episode, the patch was changed slightly. Mike retained the basic design of the Apollo 17 patch, which was the work of legendary space artist Robert McCall, added the name and mission of the Charbydis, and softened the face to suggest Charbydis's form as a human woman. The galaxy in the original patch was enlarged to suggest an ocean whirlpool." 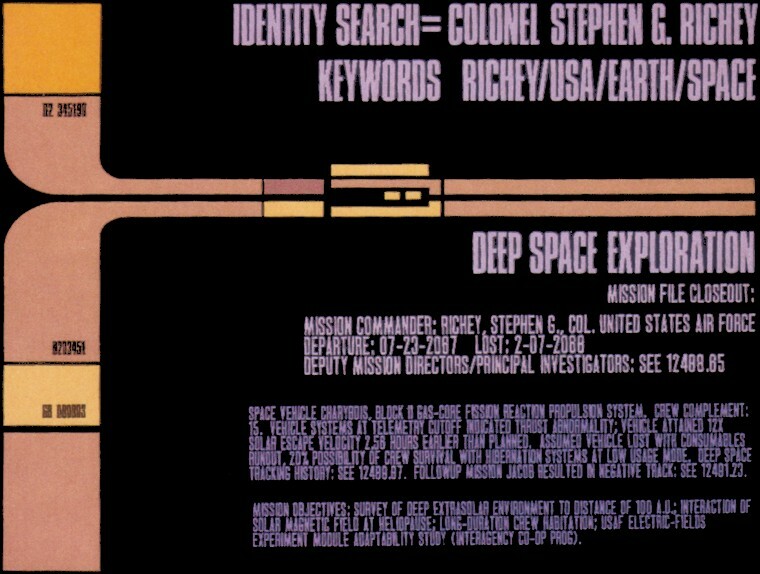 An unused okudagram was released in Star Trek: The Next Generation - The Continuing Mission. It provided further details on the ship, crew, and mission. The space vehicle Charybdis was equipped with a block D gas-core fission reaction propulsion system. Complete crew complement on the mission was fifteen. Richey was given the middle initial G. The ship was equipped with hibernation systems. The ship's extrasolar survey mission objectives included the survey of deep extra solar environment to distance of 100 au, interaction of the solar magnetic field at heliopause, long-duration crew habitation, and a USAF electric fields experiment module adaptability study in an interagency co-operation. NASA lost contact with the Charybdis following the apparent failure of the ship's telemetry system on February 7, 2038. The official NASA report read: "Vehicle systems at telemetry cutoff indicated thrust abnormality. Vehicle attained 12× solar escape velocity 2.56 hours earlier than planned. Assumed vehicle was lost with consumables run out, 20% possibility of crew survival with hibernation systems at low usage mode. Follow up mission Jacob resulted in negative track." The okudagram gave the years of launch and the year the mission was lost as 2087 and 2088 in an apparent typo. In the episode's script, the Charybdis had a terrestrial launch date of 7-23-2067. It was the first manned attempt to travel beyond the confines of the Euclidian star system. The telemetry system failed and the ship was never heard from again.